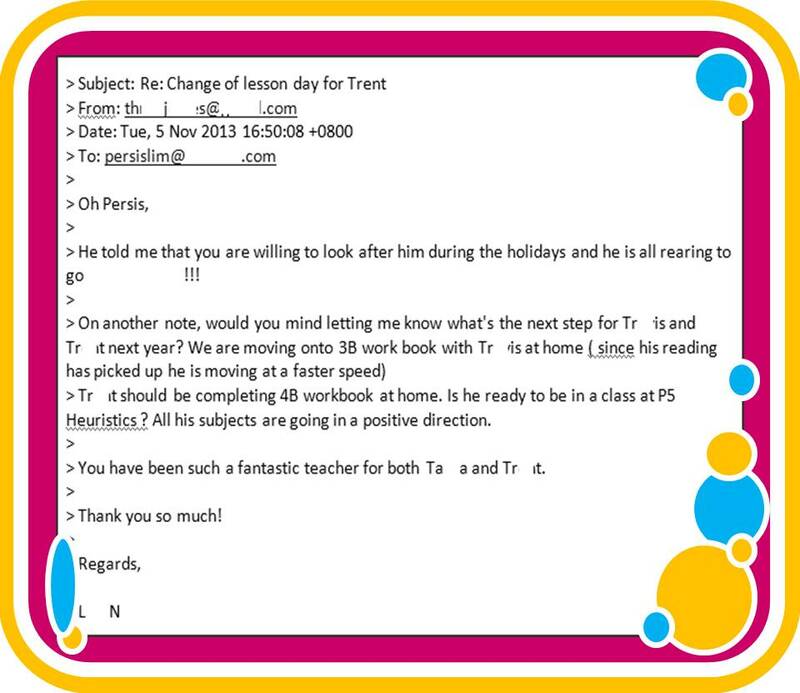 We want to thank parents and pupils who write to us…. you encourage us to do better! We are happy for your achievements! Congratulations for the Outstanding Achievement! This student has been taught by both Ms. Persis and then Mr. Bosco in Sec. 1. Teacher’s Day is here and we would like to thank our students for writing Thank You notes to us! This madam is so glad to hear from you! 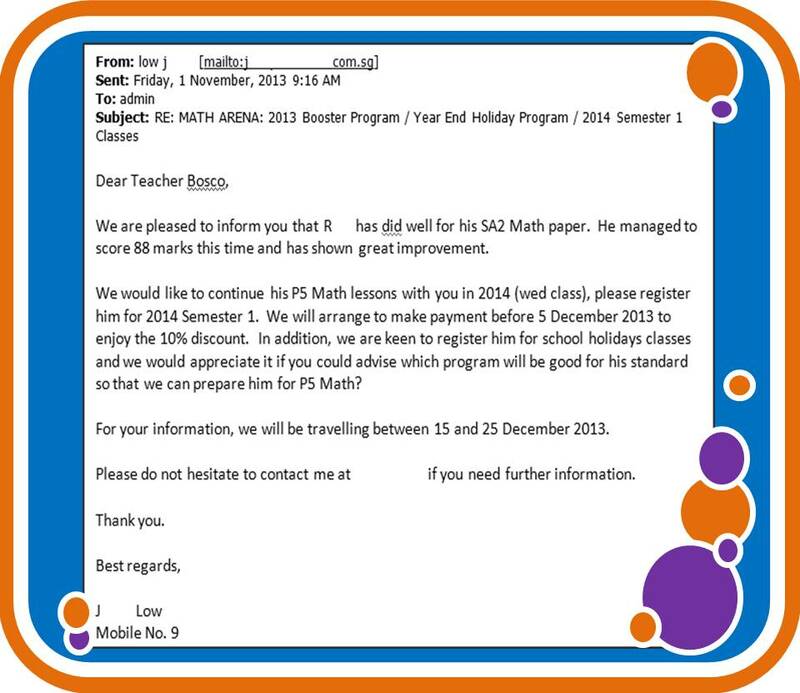 We are glad to know that your child is enjoying and benefiting from our Math and Science classes. Thank you for telling us. It’s really a splendid achievement and we are all proud of your success. Over the years, I have parents calling us with nice words of appreciation. Such words, make teaching a joy. Their encouragement tells us that we are doing the right thing — doing this work. Some have emailed me, but this is the first time I have a parent penned her thoughts in such detail. Thank You. Although it smacks of self promotion, i hope the parent doesn’t mind and readers would find it alright. I have removed all names. It is a fact that it takes a whole village to nurture a child and I could not agree more with that statement. I am penning this e-mail simply for one reason — I am truly grateful and touched by all your effort and sincerity when teaching maths to X. The methods taught emphasizes on execution so as to cut down on mathematical carelessness and the excitement you bring to his plate when new strategic methods are introduce. Nothing makes me happier than to see X elated when empowered with the ability to apply those methods effortlessly and solve those problem sums. That has been a long time coming and was not the case always! I have seen many a frustration when he is unable to resolve a mathematical sum. This fact made more poignant as I recall the many disappointments that my husband and I discovered along the way with some of the tuition centers, as they make claim to promises of A-stars and unique mathematical strategies! skeptical, as you may understand why by now. A call placed to Doris in November 2010 changed all that as she convinced me of the quality of teaching done at ‘Maths Arena’. Looking back, I have her to thank, as she never quite gave up placing calls to me, to invite me down for a try! We did so in December last and the rest as they say, is history. I approached you a month ago with concerns about Maths PSLE and the final lap towards achieving X’s desired goal and mastery of the paper. Going in, I was not sure what the outcome of my concerns would be but you touched me with your earnesty and you took on my concerns and have since addressed them. I cannot begin to express my relief when that happened and my gratitude to you for making it personal. I am also aware that you prepare his lessons ahead of time and with each lesson, a lot more is covered. A word of commendation also, for taking on worksheets done from home and where there are mistakes, you ensure that his thought process are corrected. Two weeks back, X mentioned a thought that resounded what essentially made “The Difference”. He said that he found a “connection” with you that endeared him to you. What I believe he is saying is that of the “Heartware” which is often difficult to find between that of a tutor and a child. My husband and I are fortunate that X has found a tutor whom he looks up to and is motivated to do well. He always looks forward to attending lessons with you as he enjoys the challenges and speed at which the lessons progress. Once again, Thank You, Persis for all your effort and dedication to X. Our appreciation. And it is my joy to teach your child. Thank you for letting us know…..
Tuesday is a good day for me, it’s my day off! I am happy to return to the centre today and find that two parents had written to tell us that their children are enjoying my lessons! Such notes encourage us to want to do better in our teaching. Thank you for letting us know. Another note of encouragement came in recently. Thank you! This time it was via SMS from a parent, giving feedback on our trainer, Mr. Wang. 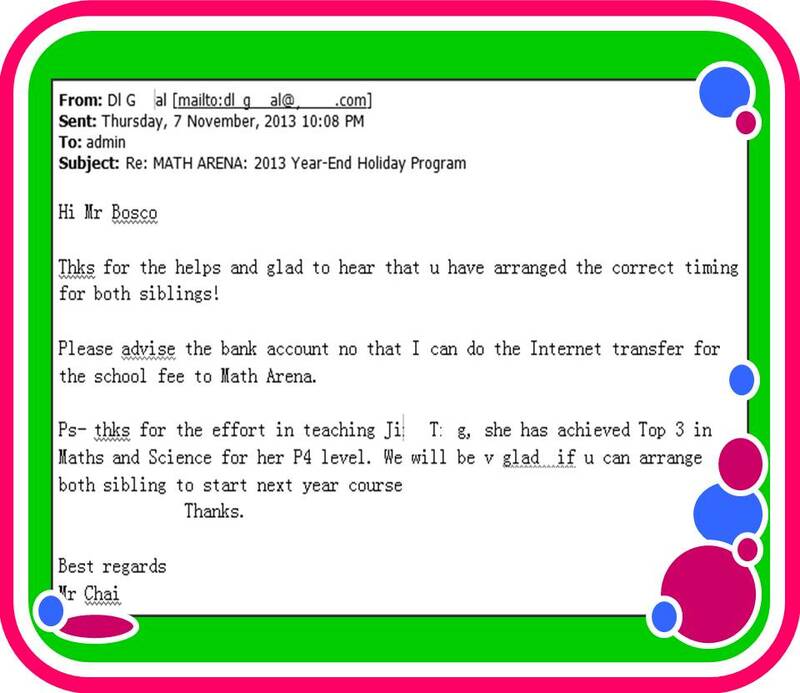 Like many of us, Mr. Wang recieves his training from Maths Hub (which is always on-going…. thank you, Michael) and has begun teaching at our centre. I am happy that pupils are bonding well with him and many appreciate his clear explanation of concepts. We are touched when parents tell us we have been of help to their children, like this parent just did yesterday. Your child’s hard work and good attitude has brought him thus far and I am happy to be his teacher! Its great to receive words of appreciation from those you teach. Every small note like these will always brighten up our day.